The drive was about 5 hours from the festival location the night before. We’re riding pretty high from a great evening and a decent night’s sleep since it was a relatively early end to the day yesterday. We are staying in the heart of Torun and were going to explore the old city center, but a heavy rain upon our entrance the city hampers our desire to go out. In addition to this being one of the beautiful old towns of Europe, this town – as well as tomorrow’s stop of Olsztyn – has a historically famous resident. Copernicus lived in Torun and Olsztyn for most of his life. There are statues, markers, and the usual tourist-friendly themed throughout both cities that we will barely see because of the weather and because we are working. The venue, Hard Rock Pamela, is a very interesting place. It almost feels more like a huge one story home with a gigantic wrap-around covered patio then a venue. Large couches that occupy the center of the “house where the dining room should probably exist only add to the feel. The bar is essentially where a kitchen would be, and you can order drinks from 2 sides, one near the front of the house and another by the couch-lined room. People start to fill up this venue pretty early. It is another eclectic crowd. There’s a large group of young people dressed in a variety of styles, some seriously-rocker dudes hanging out by themselves, and a dozen or so older couples here – including one exchanging a lot of spit as they make-out on a couch right in the center of the house. This night’s other element is the opening band for us: Kissi. Kissi (pronounced Kee-shee) is the premier (perhaps only?) 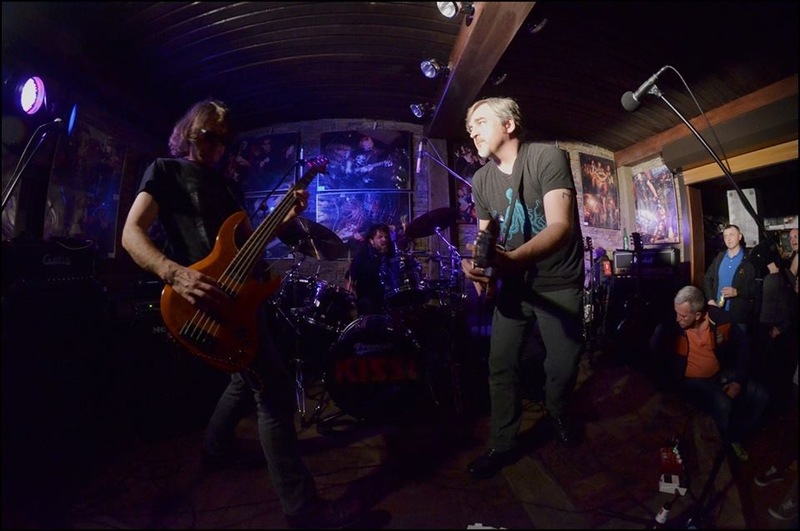 Polish Kiss-cover band. We talk a little bit with a couple of the members before the show. They’re nice guys. Conversations were a bit hard to track because we had work to do (sound checks, mainly) and some language barriers, but we gather a couple of things from talking to the guys. One, they are a little self-conscious about being judged for having Polish-accents singing Kiss songs. We say we don’t care. Second, they indicate their manager expressed reluctance with them being in full costume opening for a “blues” band. We assure them that we are not one of those types of blues bands and that we Really want them to be in costume. And right before the show begin, Kissi appears in full 70’s-era Kiss outfits. They really went for it, from the make-up to the boots. It’s quite awesome. I happen to be by the back entrance as they are sneaking by the crowd in order to spring the full glory on the crowd as a surprise. I can’t hold back my enthusiasm. I start yelling and applauding. This alone is earning my respect. They go out and put on a hell of a show. They play a bunch of the classic Kiss songs, Love Gun, Detroit Rock City, etc (and they thankfully avoided playing Beth). They were giving it their all and they had chops too. “Ace” and “Gene” were especially into it. This was not expected when we began the tour. I’m so glad we got to experience it. After Kissi was done, they’d warmed the crowd up nicely. We could tell that this would be our most rock-n-roll set of the tour, probably even more so than at the wild party at the “Las, Wada, i Blues” festival at the beginning of tour. Kissi’s drummer was nice enough to let me borrow most of his kit. Yet another backlined drum kit to adjust to, but I’m cool with the challenge. It took a song or two to work out some of the kinks, but we could seemingly do no wrong for this crowd. They crowded the stage and swayed and danced. A bunch of photographers snapped pictures and it really was a rock-n-roll night. Everyone was sweating within minutes. They cheered us on and we shouted back at them. One guy came up mid-song, during “Rabbit Run” I believe, and offered me a beer. Um, I’m drumming here but thanks anyway. We got called for 2 encores. We basically played our most heavy songs, without going too deep into the psychedelic-end of our catalog. We could seemingly do no wrong tonight, except for the awful “Copernicus Pizza” that we had for dinner. He was a great astronomer, but whoever named their rot-gut pizza after him did him no justice. If that’s the worst part of the day, it was a damn good one. 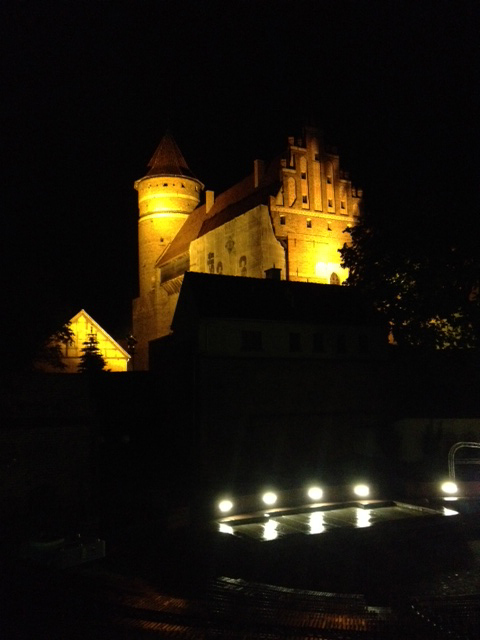 Tuesday May 13, 2014 – Olzstyn, Poland. It’s about a 2 1/2 hour drive from Torun to Olzstyn. Olzstyn is picturesque and we are staying right in the central square next to ancient castle. The venue is a cultural center that is on the grounds right outside of the castle, in the shadows of a famous Copernicus statue as well. Our hotel is attached to the other end of the small parking lot, so everything is close. Everybody’s got a view of the castle from their rooms on the one side of the hotel. I’m on the other side. I have a view of the hotel’s dumpster. During the summer months, they have the outdoor amphitheater on the grounds set up for shows but since it’s still too early in the season we will perform indoors. Whoever created this venue was quite ingenious. They used the permanent seating for the amphitheater to create a closed-in shelter for an indoor venue. They get 2 performance spaces in this prime real estate within one area of square footage. It’s an early show tonight – 6pm. This will be the inverse of last night. The crowd will be made up of a lot of 30-somethings and a number of middle-aged or older individuals. They will all be sitting throughout the show on the risers, with the only sweat being emitted from us on stage. We start off with more of our blues numbers. We begin with our ode to Furry Lewis called “Furry,” then go to the bluesy numbers “Devil Eyes” and “Fireman” (our take on RL Burnside’s Fireman Ring the Bell). The dynamics feel great. We are really playing loose tonight, but with a greater range of dynamics than the night before. I think getting our rocks off in Torun allows us to feel good about pulling things back a bit on the blues numbers and then altering the flow with dramatic stops and the occasional flurry on an instrument or for part of a song.